This story is a typical slice of life. I personally love and recommend it very much. It will make you laugh and give you food for thought as well. As the title, “My Penny-pinching Husband”, shows, it’s dealing with money matters and the situations that they are generating in a particular home as in many others owing to the poor economy. Do read, comment and share. And in case you’re wondering, the story is entirely fictional. As I was getting out the toothpaste from the bathroom cabinet, my husband, Desmond, brought me an unsolicited cup of water. “For brushing your teeth.” He stood there and crossed his arms, daring me to do otherwise. This was a fight waiting to happen. A gentle, inner voice told me to use the water but I wasn’t going to listen. I was going to give as good as I got this time around, no backing down. “Mtcheew!” I hissed as I went to pick a sachet of water from the bag in the kitchen. I ignored him and continued brushing my teeth at the kitchen sink. I concentrated on my tongue like there was a prize to be won for my efforts. I was making a point in a way. Ignoring him was just as loud as arguing with him which I would get to shortly if he didn’t let up. “Don’t be ridiculous! Why shouldn’t I check the cost of things …?” I cut him off. I left him and went to the bedroom fuming. This argument had been smouldering under the surface of our exchanges about money matters for a long while, dating back to our courtship days. Desmond visited me once then and was alarmed that I drank bottled water at home! Apparently, as far as he was concerned, bottled water was meant solely for special occasions. Lol! In six of the eight months that we’ve been married, he has made a show of being frugal by avoiding things he considered luxuries like jam, mayonnaise, eggs, corn flakes, stuff like that. He expected me to follow suit. But I pretended I didn’t notice. So if he skipped them while shopping, I bought them when I did. Realising that subtle won’t do it, he began to voice his concerns. I refused to engage because I didn’t see what he hoped to accomplish and I didn’t want to create bad blood by arguing with him about it. But instead of letting sleeping dogs lie, he decided to push his agenda by bringing that cup of water to me. Well, I’d had enough and was glad I’d made my stance plain. In fact, I wasn’t satisfied. I needed to let him know I wasn’t having the environment of deprivation he was trying to foist on our home. So I went searching for him. He was switching on the TV by remote to listen to the news but that wasn’t gonna happen. I was expanding the scope of the argument to encompass all the cuts Desmond had made lately like lowering our cable TV subscription to the cheapest bouquet that entitles one to watch only several channels (mostly news stations) and refusing to repair our generator, forcing us to stay without power when the utility company failed us (which was like every other day). Desmond was no longer paying attention. He had selected a local news station and was raising the sound. I went to the bedroom and got dressed. I felt I still needed to drive my point home. So I went to a nearby street vendor and bought fresh fruits worth a thousand Naira (a few each of mangoes, oranges and avocado pears). When I got home, I washed the pears to eat bread with them. I invited Desmond to join me and, sure enough, he asked me what I paid for each pear. Desmond declined and I laughed knowing that he will later eat it. I’m so thankful I have a good job and we’re keeping our finances separate. Otherwise he might just kill himself, not me, with this his penny-pinching habit and I’m not ready to be a widow. And to further save him from himself, I will fix that generator today or buy a new one. I will also restore our former cable bouquet so we can have our pick of great shows to relax with after a hard day’s work. You only live once, they say. Bad economy or not, Desmond and I will enjoy our lives. He may argue a little at first but I know he’ll have fun and we’ll be happy as we deserve to be. Which of these characters are you like: Gladys or Desmond? Do you think Gladys is being unreasonable about how to spend money? Are there some strategies you have adopted to cope with the high cost of living? Do share with us. You're right, my dear. They do have understanding even though they may not totally agree, hence the cuddle at the end. Thanks for your lovely comment and be highly blessed in Jesus' name. This is really funny! My dad posess same characters of Gladys while my mom's is just like Desmond.Lols! It's good to live a sweet life but not carelessly. It won't be an exaggeration saying that "No one hates enjoyment",be careful with how you spend & also be mindful that you live your life just once.Enjoy yourself provided you have the required means not the other way round.. I must say that Desmond was only being frugal,selfish and unfair unto himself and his wife. The economic status of the country shouldn't be an obstacle to your life of comfort. Yes, I believe so too. Happy weekend to you, Chiamaka! Lol! Bless you, Hillary! Wish you told me what you like about it though. It relates to what's happening in my household, the husband is just the equivalent of my mother. She's really economical about everything: water, food , just name it! I don't blame Desmond for he is being careful to survive this hardship. One thing about women is they live the life of spending, they don't know the economy is hard and whenever things are hard the woman blames the man or even makes him take his own life in hustling to see the family live a standard life. Na waa oh! Not all women are like that. Some women are the breadwinners in their homes. And not all men are hardworking. There are good and bad qualities in both men and women. Bless you! I think its nice that both tried to get along even with differences on how to spend. Yeah, I think they have a healthy marriage. You are blessed, Chinyete! i think both of them are right in their own ways, even though the wife happens to understand the husband's point of view she still doesn't want to live wretchedly just because the economy is hard. Yeah, there's something to be said for both points of view. They just need to reach a compromise. You are blessed, Chisom! One really needs to cut down on expenses especially since the income isn't increased like goods and services. I quite agree with Desmond's stand, what's so wrong with tap water for brushing anyway. With proper communication they will surely reach a consensus. The story is typical of the times. Glad to hear from you, Faith. My dear, I agree with Desmond too, esp about the tap water. Lol! One cannot but notice the rate of inflation and make certain adjustments. However, I also envy people like Gladys who don't worry or deny themselves so much because of it. You are richly blessed in Jesus' name. A very funny, yet thought-provoking story about different points of view on how to survive in a recession. I believe that a balance could be struck by the couple in the narrative; sustain some affordable luxuries and enforce some belt-tightening measures. But the most important thing to learn here, as many have pointed out is that their differences not be allowed to drive a wedge between them (the couple). Understanding is key in every relationship. Delighted to hear from you, Sima! I concur. What God has joined together, let the recession not put asunder. Hope all is well with you. Yes, I subscribe to the idea of balance. Bless you, Ebi! Indeed, this piece is funny and educative as well. I believe that what we consume for the purpose of having a fit and healthier life should be our top priority irrespective of the economic situation in the country. And pls Desmond should b happy dat his wife is not complaining and is ever ready to bring money from her salary to support their family. I actually think they complement each other well. If one spends without thinking, it's good they are with someone who counts the cost before they eat themselves into penury. God bless you, Charity. Mum, one thing i love about this piece is that Gladys reflected my life. I cannot afford to kill myself because of economic condition. Lol! That means you have some means of sustenance. Otherwise, you can't reason like that. Bless you, Victor! This is so much like what happens in my home. My father wants us to manage everything: from one sachet of milk and milo each down to switching off lights everytime we are not in the room to conserve energy and make the pre-paid meter last longer. Seriously! My mother, on the other hand, believes life is to enjoy not endure. Personally, I think if you have the money, why not spend it? Reasonably, mind you. Just be comfortable without being overly frugal. Okay, so you're like your mum and Gladys. Interesting. I think your parents complement each other well. They have the features from both sides to live well without being wasteful. Bless you, Kat! The truth is that, understanding is the key to success in marriage and relationship, and also money is good! Abi oh! May God bring the money boku boku in Jesus' name. Hmmm, this is a very good story...I think the problem of the couple is that the wife is living a high class life irrespective of how the economy of the country is. I mean, who brushes their teeth with pure water in this present time...my advice to the woman is to stop that habit at once so she can live a peaceful life with her husband cause even if her husband loves her and would tolerate her character, what will happen when she give birth to children...? will she train them that way and what if they don't have enough funds to support that lifestyle, what happens? Thanks for your comment, Joana! You've raised some pertinent questions but I'm not sure the woman is living high-class. Rather, I think that the way the economy has been, things that people normally took for granted are receiving a hard look, with the aim of dropping some. The pure water matter I do not support though. You are blessed, my dear! It's interesting, yes the economy seems bad, but I really love Gladys' sense of humor, though I'm not like her. it's good there is some sort of understanding in their marriage. As a lady, I don't think starving is the remedy for saving. Desmond has a point, yes, but I still stand for the saying, 'Enjoy it while it lasts'. Yes, my dear, there's something good on both sides but moderation is called for all around. You are blessed! The marital life of Gladys and Desmond is one that lacks mutual understanding. i think that Gladys defaulted in some ways as i consider it not appropriate to spend unreasonably, it might not be totally unreasonable though but there must be an alarming necessity before one should spend considering the present state of the economy. on the other hand, there are some spending that don't worth making emphasis on as they are necessary, just like the buying of fruits and some other little things required for the upkeep and well-being of the family. Am a bit like Desmond but not totally, i will prefer my wife spending less on luxuries and save more for the rainy day. To some extent Gladys is unreasonable. i don't see anything wrong in brushing with tap water. Yes, considering the current status of the economy one can't help but be conscious of his or her spending. So considering this, i go for my utmost priority at that point in time. Hi Victor! I really don't see Gladys as a spendthrift going by what she itemized she wanted to spend on. I guess if one is not accustomed to those things or earns little, they will be forced to forgo them. The tap water matter though was over the top. You are blessed! A very funny piece if I must say so. To my understanding, Desmond isn't wrong but I guess he pushed things a little bit to the extreme and as always, a woman is there to help complete him and also help add a spice to his life. Couples who are more of the opposite of each other share more love than the vice versa. Lol, just saying based on observation though. No matter the situation in your country man must survive.Desmond motives were to make things better but he takes it too far at least someone should have fun in life, love is paramount in the life of these couple but Desmond should try to Netflix and chill because life is too short. Abi oh! Lol! You are blessed, Emmanuel! the story is quite interesting and educative...one should always try to live a happy life irrespective of the poor economic situations. all the same, love and mutual understanding matters most in every relationship. WOW, this is really a nice one ma, any way, Desmond is not to be blamed for checking the cost of things but despite the economy, we should try to live our lives comfortably. Great piece. Desmond is just hyperactive about the economic situation of Nigeria, he should be thankful that Gladys is not solely dependent on him for everything. Gladys is a good wife who doesn't want her husband to die before his time! I agree with your assessment. It's good to be careful but moderation is needed even when we're doing a good thing, otherwise it becomes bad. Showers of blessings on you, my dear, in Jesus' name. this is nice Ma. I am with Gladys. we have to enjoy life and put the devil to shame jarri. Just because the economy is bad does not mean I should live uncomfortably, when I could grant most of my needs. Though, some things should be stopped to avoid unnecessary spending. I hope Gladys won’t change from using sachet water to bottle water for her mouth washing. Lol. Wow, great expectations! You are such an optimistic lady. I love that. You are blessed! I'd love to say that I like particularly Desmond because considering the way Gladys responded, he might have beaten her if he was hot tempered. I like the fact that he was able to control himself although at the end, she remembered love and went back to him. The fact remains that one has only one life to live so spending the money is obviously not a bad idea either. My dear, any man who resorts to beating his wife because she's outspoken has a serious problem. Cheers! Too much of everything is bad, Yes, Desmond is considering how bad the economy is, he should also consider the happiness of his wife. For Gladys, she should know the kind of character she is married to. I think if they moderate things at each other's test, they won't notice their flaws again. the husband wants to save the family from spending more than they earn and that's commendable. they should both arrive at a compromise to provide all their needs while spending moderately. thumbs up ma. An interesting story indeed!! No matter the situation of the economy, one should still learn to enjoy life but should do so moderately. Inconveniencing yourself because of the economic situation won't yield any good nor change d situation of d economy. Although Gladys had made her points but she still went back to Desmond becos she truly loved him poor economy aside. The fact that the economy is bad doesn't mean that one should live in abject poverty and difficulty. Gladys only wanted a comfortable life, not necessarily luxurious. Desmond, on the other hand, meant well but his manner of approach was offensive. Nice story. I love the way Gladys spoke her mind. The fact that there is an economic downturn in the country doesn't mean that they should not enjoy some of the luxuries they have both been enjoying before. There are still other ways of managing their incomes. I thank God that Gladys had a job. If not, it would have turned into something else. Life is too short and so, we should at least try to enjoy our lives and have fun. Though extravagant, Gladys is not totally wrong for wanting to maintain her health. But I think it necessary that she considers the nature of the economy and mellow down the high purchases. Nevertheless, thee exchange of words is not even harsh. I think their union can last long since there is understanding mingled with tolerance even in the midst of differences. This short story is indeed interesting and funny. I wont blame Desmond because the way this country is going, no one can predict tomorrow. he is a husband that wants what is best for his family. But Desmond's managing skills are inconveniencing to his wife. Left for me, i wouldn't want to live with a man with all those characters. Since Gladys wants to live a life with luxury, she should contribute reasonably to the family. I can't stop laughing at Desmond's character, he is so penny-pinching, lolz, I can't marry one like him. I like the character of Gladys because even with the way Desmond behaves, she still loves and respects him. that is the feature of a good wife. Wonderful Ma! Kudos! A hilarious story. Nice one. A marriage will last when couples understand each other and try to balance the economy with their earnings. Wow! This story was straight to the point. It is true that the economy is hard but that shouldn't stop one from living a comfortable life when he can very much afford it. Why else does one work if not to live comfortably? Desmond should understand that cutting off some of their needs will not improve the economy. Every woman in my opinion should also have something doing and not solely depending on a man. If Gladys had nothing doing, she wouldn't have a choice but to live a life she was not used to and didn't want. In spite of the little argument between Gladys and Desmond, Gladys didn't find that as a ground to disrespect her husband. Gladys didn't neglect her husband even when she provided what Desmond called luxury for her family due to his penny pinching attitude. Instead, she carried him along. This story is quite interesting. one important thing in marriage is understanding. Gladys and Desmond understand each other despite the fact that the economy of the country was so bad which almost caused problem in their family but because of the love and understanding they have for each other, they were able to overcome the problem. Gladys has the qualities of a good wife which every woman should possess. Thank you very much ma for this wonderful story. Really an interesting story ma, back to economy I know things are hard and people see it as an excuse for not eating good food and living comfortable, moving with the slogan "Things are hard." I will say that Gladys ideas are not bad, after all life is lived once so you enjoy while you still can. funny characters though but Gladys didnt really have to be like that at first, its marriage though, everything happens, and thats what makes couples stronger, surviving the hard times and understanding each other. wow! this story is short, educating and very interesting. the fact that the economy is bad is not enough reason for living an uncomfortable life, rather it calls for carefulness and not spending extravagantly. i am not married yet but i believe that understanding and co-operation is what sustains marriage. having a good job shouldn't delete the fact that the economy can affect it dangerously; therefore i am not supporting Desmond or his wife, but am of the opinion that whether the economy is bad or good, it is important to save for the rainy days which no one can predict. we should learn even as youths to enjoy our money wisely, not foolishly or extravagantly. A very good piece Ma. The story is a typical reflection of the average African couple, one spouse is tight fisted and expects the other to follow suit. However, couples don't always think alike. They have to be different so that one can correct the other in any case of doing wrong. Desmond shares similar traits with my dad, to some extent thouhgh. But i would like to note that Desmond's penny pinching habit is on the extreme. It's pious and considered rational for one to be frugal with funds and avoid leading an extravagnat lifestyle, but on the other hand, there are basic expenditures that should be made, provided the funds are in existence. I actually do not support the idea of refusing to get the generator set repaired, irrespective of the fact that power outages happens to be on a regular basis. Also, money worked for should be spent to provide necesseties, and also add spice to one's life and that of others also. well i don't think Gladys was wrong in her desires to live a comfortable life. As she said, life can only be lived once. However, this does not mean one should be extravagant but one should be able to live comfortably with the resources available. Great piece, Ma! The story is really fantastic. However, from my point of view, Desmond was trying to help but he didn't do it the right way. He should have at least used the money to take care of important needs. Even at that, he was trying to make their lives better. Despite the bad situation of the country, Gladys still wanted to enjoy her married life. Desmond, on the other hand, being aware of the state of things, thought it wise to reduce the rate of their spending in other to save more. Gladys never understood her husbands motive but thought it as being Penny- pinching. To her one's got but one life to live and so must enjoy it while still alive, so whether good or bad economy one got to enjoy. And I also think that Desmond responded to the bad economy in a hard way by trying to penny-pinch even to his own detriment. The state of the economy should not dictate to one how to live your life. This was the angle Gladys was coming from. In all, one needs to be wise in terms of monetary expenses. This story has an amazing content. For Gladys, its just one life one's got and so should enjoy while one still can. " when the economy improves" as Desmond would say, but the truth still remains that, such time might not come in your life time. Yes, extravagance in spending isn't good at all, but this doesn't mean that while you need a thing and can get it, you suffer yourself not to. The problem I'll say with Desmond is a miserly habit. I mean, why would one choose not to spend even to the obvious detriment of his health? and through the text, one would see that Desmond wanted and helped in the consumption of those things bought by Gladys. To me, Gladys' actions weren't wrong. It is therefore important that one spend while one can and need to but also avoid extravagance. This story is interesting. It's a must read for all couples because it treated the issue of financial independence and management between couples. Though the whole scenario is hilarious, I think couples should learn from the situation and accommodate each other's differences and make compromise. It is a beautiful piece. Wow!!! This is a nice post. I don't believe this kind of stinginess still exists. even though there is a hardship in the country, that shouldn't deprive us the privilege of taking good care of ourselves. Desmond should learn how to stabilize the economy and see reasons with his wife and to make things right. It exists, even possibly worse forms, my dear. And by stabilizing the economy, I believe you're talking about his family. Nothing much he can do about Nigeria's economy other than pray. Cheers! The story is absolutely not what I expected. having seen the title of the story, I thought it would be about a stingy man and an extravagant wife. But, this wasn't so in the story. Desmond isn't stingy, he's only trying to limit how he spends. Gladys also isn't extravagant, but doesn't want to live her life in misery either just because she's trying to manage the economy. All that is required here is for both to reach a compromise which is what the woman did. I like how Gladys handled the situation and did not let it escalate. This is one beautiful story. Lovely comment. 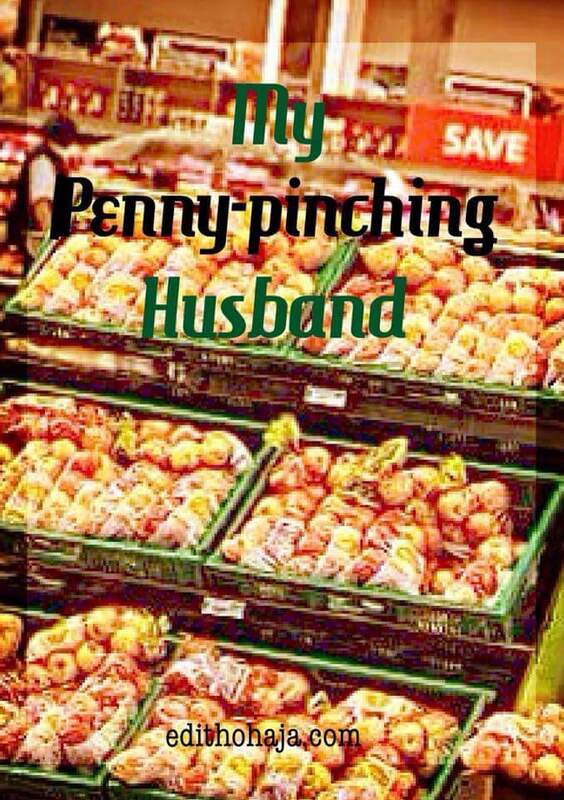 The wife, who is the narrator, does feel her husband is a penny-pincher tho'. She gave examples but I guess it depends on one's way of seeing things. Cheers! There are difficult times in a family but the most important thing is the ability of couples to stand their ground and remember their vows (for better for worse). The husband has good intentions toward the wife and their finances. So far Gladys is financially stable, she can help out to ease the husband's financial stresses and make her marriage peaceful. She is doing just that. I think her desire to step in to make life comfortable for them in the face of the bad economy is admirable. Desmond and Gladys think differently. the husband seems not to do all things needed from him financially but his intention was to overcome the bad economy and save during the hardship. marriage is union of two, so the struggle is for the two of them and Gladys should accommodate the nature of things and support since her work is stable in order to avoid their usual quarrels on expenses. My dear, this is their first open quarrel about it, according to the story, and Gladys is picking up the slack, isn't she? You are blessed! Gladys is a bit too much of a frivolous spender and a tad materialistic. I do have a strong attachment to the habit displayed by Desmond. I feel that way because we all need to be careful with spending, especially with the situation the country is in. It's really quite sad when you're trying to manage the little you have and your spouse seems hell-bent on making you bankrupt! Lol! Drama, much! Gladys wasn't spending Desmond's money. my dad always tell me to save before I spend. Desmond was only trying to save since things are getting hard in the country. Gladys should have understood that. She can do without luxurious things for a while. The husband, Desmond, tries to be frugal but the wife, Gladys, wants a seemingly lavish life but a balance is all there should be in a marriage. what a wonderful satirical story. ma, i think it is common among the menfolk today. being thrifty or frugal is not a way out of recession or economic drought. husbands hear o! I no send you oh! Lols! There is need for frugality alright but moderation is required before somebody kills himself. Although the economy of Nigeria is bad and it seems like it's not going to be good soon, that doesn't warrant us to deprive ourselves of the little enjoyment we can afford. Gladys, although she wasn't happy about the attitude of her husband, she isn't a nagging wife and seeks ways to make him happy. Yes, she did! Very nice of her. Bless you! Understanding is the key holding every marriage and even relationship. Money is not actually love, but it adds value to love and respect. Lol mr Desmond is pouring the condition of our economy on his wife hmmm. my mother is more like Mr Desmond but trust me she spends more than Gladys. Lol, I know this is confusing but believe me, mr Desmond is right we should learn to manage. I think the problem this couples are having is lack of mutual understanding. i don't see anything wrong in Gladys using sachet water to brush her teeth. Despite the economic situation of the country, it doesn't mean one should not eat even good food and enjoy his life. My dear, no one is supporting not eating good food but to brush one's teeth with sachet water where tap water is available? That, I think is waste as her husband rightly pointed out. Cheers! Desmond and Gladys are married I think they should learn to live together and Gladys should understand Desmond more. Interesting short story... I agree that you only live once so one should live life to the fullest. I am like Gladys o, (Aye okpe meji o) we only live once, right abintio Nigerians have always had backward economy, pipu are still making it, and will continue to make it, people are still feeding and will continue to feed. Lovely story, making me imagine marriage life, lol. This story is funny thou, is also an advice to the couples because it treated the issue of financial independence and how to manage. Couples should understand each other for a happy home. This is a good one Indeed. Gladys really loves her husband as seen in the story. In marriage, arguments will arise but love conquers all, so a little advice, marry the person you love. Lol! Desmond is really penny-pinching. The story is an interesting one. Times are hard? Yes! And we really need to cut down some unnecessary expenses. Desmond's case is different, he is so economical. One should be economical but to some extent. Nice piece , ma. Being frugal with spending should have limits,deriving oneself of some basic needs simply because the economy is running dry is not a solution,instead cut down on the quantity not the quality of what satisfies your nutritional and physical need.Desmond is taking it too far! in this our recessive economy? Both of them are typical example of my uncle and my aunt (his wife). There are many strategies that many families in Nigeria inculcate to keep up with the economy. Although Desmond's method is good, he is being too extreme about it. Managing is not dying. I like Gladys' strategy. It should have limits though. The key to marriage is understanding. No two persons are the same. Although the economy is hard but at times enjoy your self. Nice one ma. we are in a Buharicious state, son it is possible. Understanding,love and most of all, God factor is the bedrock of all companionship.Desmond being frugal is not bad,but understanding the needs of the body,the economy and state of his family should contribute to factors the wife should to note or consider before assessing her husband like that.A worthwhile and an eye opener to young couples.Marriage should be based on understanding,being unselfish and sacrifice.As little as these things,it could wreak havoc in a family.so couples should beware. This is the typical character,attitudes,behaviors and culture in most homes.i believe this story reveals to us what happens when the economy is not smiling at anybody and also what is obtainable in a relationship.It either,one of the partner is either not enlighten,educated,tight -fisted or is too loving.Enlighten in knowing how,when to spend and the usefulness of what you spent.tight-fisted in the sense that a little enjoyment is bad.Educated in the sense that everyone is claiming right. .
A story marked by the inevitable and realities of marriage. What is most striking and what I loved at the end was the fact that she felt for her husband and that love was still there.Sacrifice,commitment and knowing each other should be the first qualities and duties before one settles down.there must always be quarrels in any marriage but realizing and apologizing afterwards shows you care.Every one born has a mentality,value.they have an opinion of what is good,bad,great,lovely,extravagant,frugality.it is left for the couples to get to know these differences,adjust,adhere,sacrifice and let go when needed. Wow!this is lovely,weather the economy is good or bad we shouldn't allow it to deprive the family love.love keeps the family together. In the story, they are both right on their views except they are taking it to new lengths. Gladys has accepted that the economy is bad and may never improve but she should acknowledge it and try to minimize the money she spends. On the other hand Desmond is trying to save money but what are you saving money for it not to use it, yes, he should save but he should also indulge in things once in a while.